When punk rock arrived as a combative answer to the bloating and fatigue of 1970s rock, an odd thing happened: Bands that were interested only in plugging in and channeling Chuck Berry were cast in with Britain's latest rabble. It meant that the likes of Tom Petty and the Heartbreakers found themselves the unsuspecting, amused ambassadors of a "new" music that, from their vantage point, hardly seemed new. They were just doing what they'd done down in Florida when gigging with Skynyrd. It was the Heartbreakers' third album, Damn the Torpedoes, that got them in the front door and into our homes. 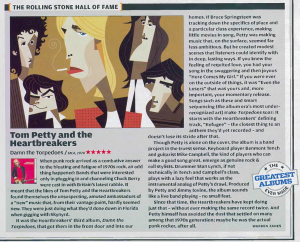 If Bruce Springsteen was tracking down the specifics of place and a particular class experience, making little movies in a song, Petty was making music that, on the surface, seemed far less ambitious. But he created modest scenes that listeners could identify with in deep, lasting ways. If you knew the feeling of requited love, you had your song in the swaggering and then joyous "Here Comes My Girl." If you were ever on the outside of things, it was "Even the Losers" that was yours, and, more important, your momentary release. Songs such as these and smart sequencing (the album era's most under-recognized art) make Torpedoes soar: It starts with the Heartbreakers defining track, "Refugee" -- the closest thing to an anthem they'd yet recorded -- and doesn't lose its stride after that. Though Petty is alone on the cover, the album is a band project in the truest sense. Keyboard player Benmont Tench and guitarist Mike Campbell, the kind of players who can make a good song great, emerge as genuine rock & roll stylists. Drummer Stan Lynch, if not technically in Tench and Campbell's class, plays with a lazy feel that works as the instrumental analog of Petty's drawl. Produced by Petty and Jimmy Iovine, the album sounds like a live band playing -- no small feat. Since that time, the Heartbreakers have kept doing just that -- without ever making the same record twice. And Petty himself has avoided the dust that settled on many among the 1970s generation; maybe he was the actual punk rocker, after all.